Zombie fans, rejoice. A new game is coming soon in 2018 to fulfill all your undead-slaying needs, and its collector's edition can have you looking the part, too. State of Decay 2's Collector's Edition is now up for pre-order, and it includes a ton of fun zombie-themed goodies. The most exciting piece is a latex zombie mask, so you can look just like one of them while you play the game. 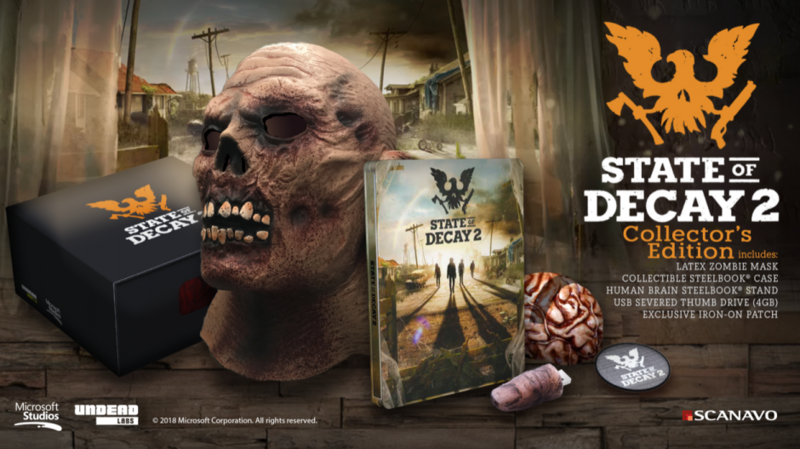 Other items include a collectible steelbook case, a human brain steelbook stand, a 4GB severed thumb USB drive, and a State of Decay 2 iron-on patch. The Collector's Edition retails for $69.99. The Xbox and Windows 10 exclusive game adds co-op for the sequel to the original game, which sold over 4.5 million copies. In the game, players will group up to scavenge, defend, and survive the zombie apocalypse. State of Decay 2 launches on May 22, and all of the editions of the game can now be pre-ordered at participating retailers.